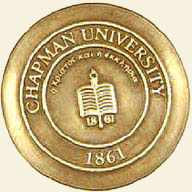 Chapman University is a comprehensive liberal arts and sciences university founded in 1861 by members of the First Christian church (Disciples of Christ). Located in historically-preserved Old Towne Orange, the university features a high-energy living and learning environment, attracting students from various faith backgrounds and nationalities. The university's governing boards includes the Board of Trustees, the Board of Governors and the President's Cabinet. Each person who is asked to serve the university displays talents and has the energy required by the University to realize its vision and fulfill its mission. The university's goal is to provide the transparency of operation that the university's entire community, including its neighbors, faculty, parents, students as well as other constituencies, expect from it. The university's Articles of Incorporation and subsequent Amendments have been filed with the Secretary of State of California. The university's Bylaws provide the roadmap by which the Board of Trustees conduct the operation of the university.